As experts in conference venues finding, Conferences UK are proud to be at the forefront of venue search technology, but that is not where our interest in technology ends. We like to keep abreast of all the latest tech developments and how they may be affecting event management and conference planning, and one of the biggest technology developments of recent years is augmented reality - also known as AR. What is Augmented Reality? LiveScience define augmented reality as 'the result of using technology to superimpose information - sounds, images and text - on the world that we see. Augmented reality adds to the reality you would ordinarily see rather than replacing it.' How is AR impacting events at the moment? 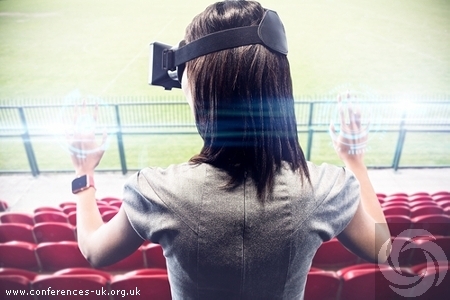 Event organisers are certainly starting to test out AR at events to see what it can bring to the table, using things such as AR photo booths at conference venues London to transport delegates into an augmented world. Some brands are even going as far as using AR technology to help delegates to experience their products without the need for the physical product to be there - such as with new car launches for example. However, AR is having the most impact on training events at the moment as it allows trainers to run much more interactive sessions than in the past, thereby offering a deeper learning experience to all attendees. Where might AR take us in the future? AR started off by being used mainly in the gaming world, but the advent of smartphones has made it much more accessible for use in daily-life - although using AR on a smartphone isn't ideal as the phone will not allow you to fully optimise your field of view. The bulky head-wear needed for AR has also prevented its widespread adoption up until now, although new companies such as Magic Leap are pushing the designs to be more comfortable and accessible for everyone. This will probably lead to a huge rise in the number of AR apps available, but the real impact will be seen in the wearable market. The race is on to see who can produce a pair of smart glasses that enable us to see both the physical and virtual world, and that really take AR to immersive heights. How can AR be used at Events? The best use of AR technology at events is probably in the field of attendee engagement. For example, Apple recently introduced ARKit which allows developers to more easily implement AR into their apps and this is a great help to event organisers who wish to create more engaging moments for people attending their events. Instead of conference attendees struggling to find information, with the use of AR it will all be laid out for them over their venue environment which will also help with engaging them in situations that they might not otherwise have become engaged in. This could be things such as moving around the venue, exploring different content available in different areas and even having presentations moving through the air. Can AR Technology be Commercialised? Yes. There are lots of branding opportunities with AR apps that will not only drive attendee experience but also fuel company growth as well. AR Apps offer exhibitors and conference sponsors many different ways to get their brand in front of conference attendees through the use of loyalty programmes, branded content and even gamification. The technology and automotive sectors within the B2C industry are already looking at ways to get their customers closer to the brand experience with the use of AR allowing them to build brand loyalty with fully immersive experiences. How else can AR be used in event planning? AR technology will be really beneficial to event organisers as well, as it will allow them to be more able to fully showcase their design for the event to clients - such as walking them through how a stage will look in the space or helping them to visualise what their corporate festival event will look like in their chosen outdoor space. This ability to fully understand what the finished event will look like will be a real boon as it will save a lot of time, and also allow planners to make notations that can help them with future events. If you are planning a conference, whether you are planning on using AR or not, and are looking for just the right venue for your vision, then please get in touch with the expert team at Conferences UK today. We can help with conference venues all over the country, from the Edinburgh conference centre to Deal Castle in Dover.